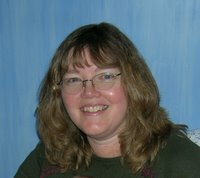 Quilting Adventures: I can't believe I came across this! I went to pick up Bernice II (180E) at the Dealer in St-Hubert (Off the Island of Montreal), which thankfully only needed some adjustments and a good cleaning. They had a stack of magazines and patterns at a discount price. 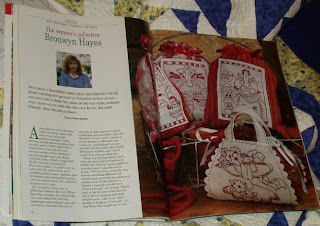 So I decided to take a peak and came across a copy of Vol 5 No 2 (June 2005) A Special Stitchery Edition published by Australian Country Threads. Now perhaps this means nothing to you but you wouldn't believe what's inside! 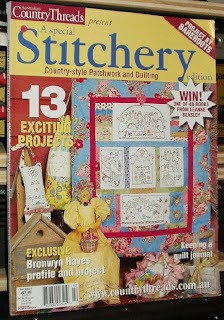 As you can see from the cover, we have an embroidered quilt designed by Bronwyn Hayes. Yes, that's the chicken lady on the top block with her friends. Not only does it have the pattern for the embroidered quilt, Mama Says, but it has an article on the designer. Right away I thought of Darlene and Wendy who have embroided designs from Ms. Hayes. 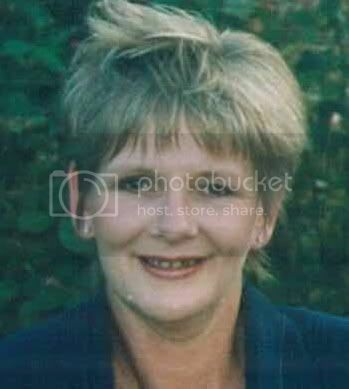 I love the chicken lady! 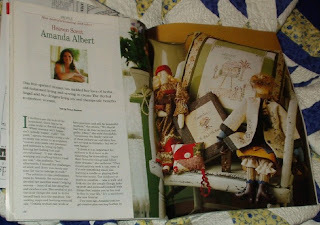 And if that in itself wasn't enough there's an article on Amanda Albert, who also has a blog The Herbal Angel, and includes a stitchery pattern, Scented Door Pillow. You have to understand, I did not know who these individuals were until recently. 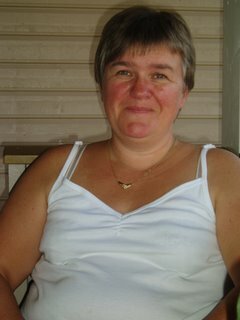 My wonderful friends on Blog Land are responsible for their introduction. Some of you might already know or own this magazine. I'm just thrilled to have come across it and on sale to boot! So, excuse me while I sit comfortably and read my magazine! And, now I'm just smiling because you hit the mother lode, my dear, it's a terrific issue. Leanne Beasley and Bronwyn Hayes in one magazine. WooHoo! I can't wait to see which project you trace first. Boy oh boy what a treasure filled magazine you have there. Can any of us bribe you to part with it? I'm waiting for my first mag to arrive from my subscription, and almost have a Bronwyn Hayes quilt finished. Enjoy. That sure is a great find. The Australian mags are often so interesting and this sure seems to be great. 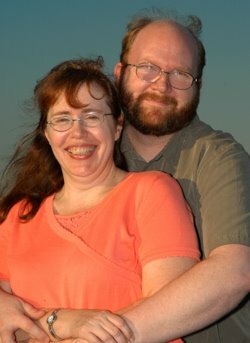 I'm jealous! What a great find. I'm going to have to start looking hard for that issue. Have you read about the stitchery swap I'm doing? Check it out on my blog. Your hooked! I look forward to seeing your stitchery. I have that issue and love it, great find. Great find!!! You will love doing stitchery. I promises. It's so relaxing. Enjoy!!! What a fantastic find! I'd be giggling about it too. I can't wait to see the results of your crayola experiment. If it works, hmmnn, I do have a pack of those markers or two around here. What a lucky find! I've had stitchery on my mind too and was looking for something that appealed to me on line today but struck out. Darn, you're lucky! LOL! Great find. Stitcheries and mags are two of the things we do very well over here. Have fun. I got a nice little package of three Australian magazines from Erica's quilt shop today--not the one you got but three others. It's your fault too. This blogging has hidden costs associated with it! Who knew about the temptation part! LOL! I really like some of the stuff they're doing over there in Oz, so the mags are fun to look through for a nice change of pace. I found a couple stitchery projects I'd love to do.